From the leading expert in the exploding field of basketball analytics, a stunning infographic decoding of the modern NBA: who shoots where, and how. The field of basketball analytics has leaped to overdrive thanks to Kirk Goldsberry, whose visual maps of players, teams, and positions have helped teams understand who really is the most valuable player at any position. SprawlBall combines stunning visuals, in-depth analysis, fun, behind-the-scenes stories and gee-whiz facts to chart a modern revolution. From the introduction of the 3-point line to today, the game has changed drastically . . .
Now, players like Steph Curry and Draymond Green are leading the charge. In chapters like “The Geography of the NBA,” “The Interior Minister (Lebron James),” “The Evolution of Steph Curry,” and “The Investor (James Harden),” Goldsberry explains why today’s on-court product—with its emphasis on shooting, passing, and spacing—has never been prettier or more democratic. And it’s never been more popular. 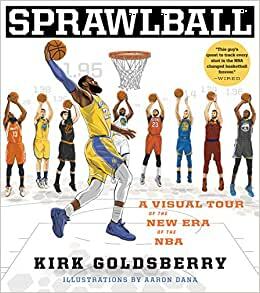 For fans of Bill Simmons and FreeDarko,SprawlBall is a bold new vision of the game, presenting an innovative, cutting-edge look at the sport based on the latest research, as well as a visual and infographic feast for fans. Rap Year Book, The: "The Most Important Rap Song From Every Year Since 1979, Discussed, Debated, and Deconstructed"
"Basketball has changed so much in the last 20 years. This book does an amazing job of describing where the NBA has been, where it is now, and where it's going." 5.0 out of 5 starsStat rich, data drone content. Great for students of the game! One of the major reasons the demise of Grantland is mourned by so many people are the wonderful analytics Mr. Goldsberry provided the site. He is still going strong on ESPN and this compendium expounds on his brilliant work for both sites. If you know his work, you are already a buyer. If you don't know his work... order this right away if you enjoy pro basketball. He is the heir to Dean Oliver's throne.